In this book Kripke’s long-time colleague, the logician and philosopher John P. Burgess, offers a thorough and self-contained guide to all of Kripke’s published books and his most important philosophical papers, old and new. It also provides an authoritative but non-technical account of Kripke’s influential contributions to the study of modal logic and logical paradoxes. Although Kripke has been anything but a system-builder, Burgess expertly uncovers the connections between different parts of his oeuvre. Kripke is shown grappling, often in opposition to existing traditions, with mysteries surrounding the nature of necessity, rule-following, and the conscious mind, as well as with intricate and intriguing puzzles about identity, belief and self-reference. Clearly contextualizing the full range of Kripke’s work, Burgess outlines, summarizes and surveys the issues raised by each of the philosopher’s major publications. Kripke will be essential reading for anyone interested in the work of one of analytic philosophy’s greatest living thinkers. John Patton Burgess is a John N. Woodhull Professor of Philosophy at Princeton University. He received his Ph.D. from the University of California, Berkeley's Group in Logic and Methodology of Science. His interests include logic, philosophy of mathematics and metaethics. "With characteristic verve and clarity, Burgess succeeds in doing what many thought impossible: presenting the best of Kripke's philosophical and technical work in a precise, readable, and highly illuminating fashion. Every philosopher should read this." "Destined to become a classic, this is the best systematic overview of Saul Kripke’s major contributions to philosophy. While each chapter and appendix provides an excellent introduction for those new to the material, old hands will relish Burgess’s provocative takes on Kripkean views of belief, rule-following, and the mind. 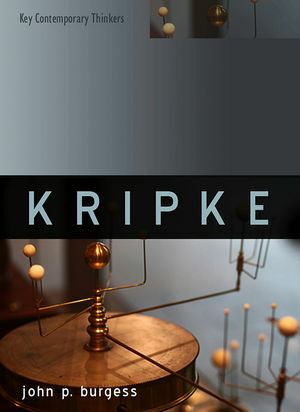 The explanation of the connection between Kripke’s technical and philosophical work on truth and modality is masterful." "Burgess provides a masterful introduction to Kripke’s philosophy, but this volume is more than that; it is a first-rate piece of philosophy in its own right, as one would expect from one of the leading philosophers of mathematics in the world."